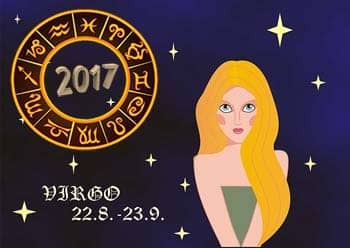 The predictions for Virgo-identities for the upcoming 2017 concern a slow pace and a great success due to this speed. You will be capable of accomplishing many things at once and your influence on the development of the events will be remarkable and essential. The things will go the way you wish. You will be in good relations with your boss, collaborators and friends. This will also greatly benefit your advancement at work. The relationships with other people will be your mainstream of the year. Give them as much heed as you can. Try to devote some time to your closest people. It goes without saying that if knowing at least approximately what happenings to expect, one can enjoy success in many things. Thus, the horoscope can help you to avoid mistakes and turn everything to your advantage. Virgo-identities will be able to see even the smallest details and prosper from them. Virgo-folks are very loyal friends. However, they experience great difficulties when making new friends. In the case, you have such friend you can always count on him or her anytime you might need a helping hand. They will do whatever is possible to aid you. They are hard workers, great organizations and pragmatic personalities. They will never miss s single detail and always properly fulfill their duties. In the previous years, you were reluctant to begin novel relationships. Nevertheless, the next year reveals a strong tendency for starting new experiences in romantic affairs. You will be romantic, optimistic, entertaining and friendly. This may seem to you pretty weird but you will like this idea. You will be full with great energies. You will try to impress other people and you will cope with this task excellently. Those Virgos who are already in relationships may experience uncommon tension, which will induce many complications. However, which way it goes nobody really knows. A lot depends on your life choices. The actions you undertake will lead you either a good way or the path of destruction. Be attentive and listen to your logical mind. In the year 2017, the older couples will be eager to try some novelties. This will refresh their relations, which may be currently in the period of stagnation. This may be a good time change something in other aspects of your life. You can change the place of living and job. This will positively reflect on your personal relations as well. You will also strengthen your bonds with your friends. Virgo-folks are well known and highly valued for their incredible resourcefulness at work. They can complete so many different tasks and enjoy a great success. Accordingly, they will prosper at their working place if they follow this tendency. There may be some alterations in the working atmosphere. Nevertheless, the confidence of these folks will help to overcome all possible complications. You should give more heed to your financial status while the year 2017 will last. There may be some problems with your earnings. You have to be sure that all of your investments and purchasing are reasonable and safe. Thanks to the promising situation at work, you may slightly overcome the problems. However, you should be always watchful. Focus on the studying of something new, which can help you with your finances. You may live through multiple stress situations in the course of the novel year. At the first signs of problems, make a break. You should have a proper rest and relax. Do not overwork or you will have some health problems. Store your energy. You will act pretty quickly with the stored energy levels. However, you should not haste. Take some time and think about every step. It is also recommended eating healthy products and avoid bad habits. Be kind to other identities. Go in for sports. For instance, you may try yoga.